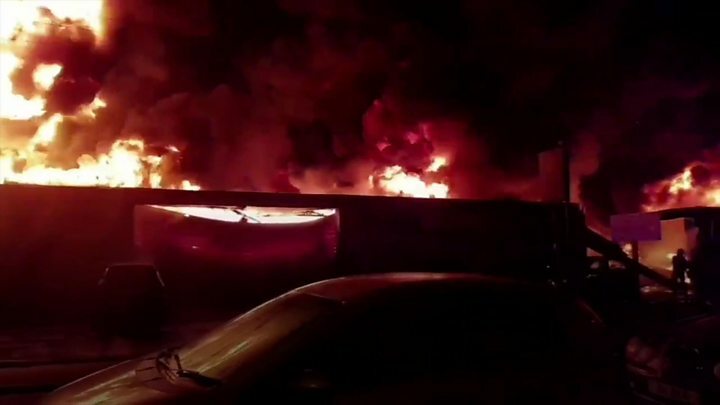 More than 100 firefighters have battled a "severe fire" at a tyre centre in Birmingham. The blaze broke out at Tornado Tyres in Wharfdale Road, Tyseley, at about 02:30 GMT. West Midlands Fire Service described the fire as "quite dangerous" and "challenging" at its height, and residents said their windows cracked. Owner Abid Mahmood said he was "devastated" and his dog was killed in the fire. Muhammad Asif, 36, who lives across the road from the tyre centre, said: "I heard a really loud bang at about 02:50 this morning. "At first it was a small fire at the back and roof of the building, and then within 10 minutes the flames had totally spread. "We live across the road and the fire was so intense, our front windows upstairs have cracked. "Even with the windows closed we could still feel the heat." Another local resident said: "The windows were cracking and the room was bright. "I opened the curtains and I had the shock of my life." Image caption The fire service said the tyre centre was "totally destroyed"
Mr Mahmood, who has owned the tyre centre and workshop for 10 years, said he suspected arson. "There were plenty of tyres inside and now everything is gone - it is devastating," he said. "I don't know what happened. Someone may have done it deliberately because tyres don't burn easily. "I'm in shock and my dog Tiger was inside. He was like my own kid." West Midlands Fire Service said 20 fire engines attended the scene and no-one was inside at the time. Area commander Neil Griffiths said the tyre dealership had been "totally destroyed". He said: "At the height of the fire the conditions were incredibly challenging and quite dangerous, which is why we needed over 100 firefighters to deal with it assertively, safely and effectively. He added the fire service was investigating the cause of the blaze. Neighbouring wholesaler Millennium Carpets was also affected. The fire was brought under control by 07:30 and firefighters are set to remain on site for most of the day. Road closures are in place and residents have been asked to avoid the area, West Midlands Police said.